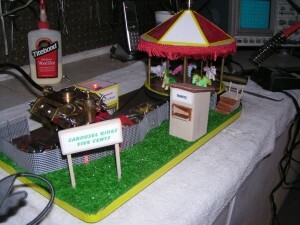 Jerry built this great little home made steam engine and the carousel that is powered from the steam engine. 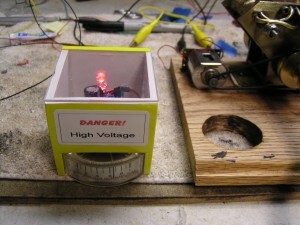 He posted a video of it in operation on you tube. 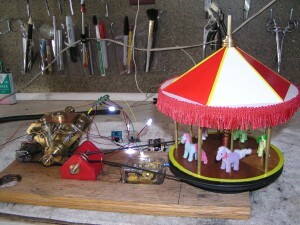 He runs the Carousel and a little generator from the steam engine, the generator is putting out ~900mV that is then boosted using a Mad Scientist Hut Joule Thief board that lights some LEDs that are around the Carousel. 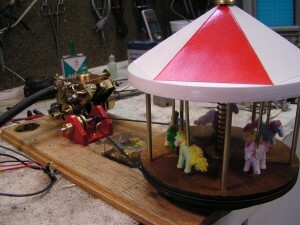 Jerry repairs old vacuum tube radios. If you are in need of getting an old vacuum tube radio back in functioning condition just send me an e-mail at madscientist@madscientisthut.com I will be sure to forward your request to Jerry.